Finally! After months of fighting to make this post and especially, the video, the best it could possibly be….It is time for me to tell you about the single greatest experience our child, and quite frankly……our family, has ever had! Several months ago, a friend sent me a video about an organization called Surfer’s Healing that sponsors day surf camps for kids with Autism. Her caption read “Isn’t this cool??! !” I had never heard of them before but was entranced by the concept and became obsessed with finding out more and getting Cannon signed up. Weeks later when the email came that he was in, I jumped up and down, cried, and danced around with Cannon saying “You’re going surfing!” I had been showing him youtube videos frequently of other kids participating in the event so he knew what I was talking about! My excitement was through the roof because I just knew this day would be a powerful and special day for Cannon and our family! 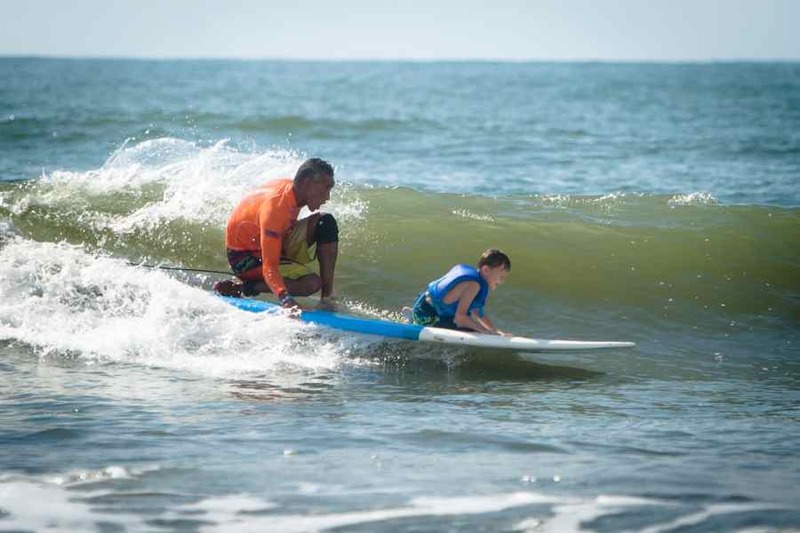 Just incase you don’t know the backstory……Surfer’s Healing is a 12-year old organization started by former pro surfer Israel (Izzy) and his wife Danielle Paskowitz. They are parents of 3 children. One of which has Autism. His name is Isaiah and he is now in his early 20’s. When Isaiah was a baby…..he was fine (like Cannon). At one time, he even had about 50 words in his vocabulary. But slowly and steadily that changed and he became virtually non-verbal and is now considered to be low functioning Autistic. 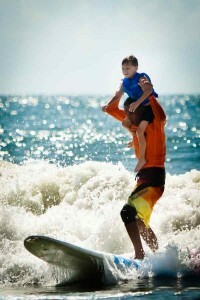 In attempts to connect in any way with his child, Izzy would put his son on a surfboard, paddle out into the ocean, and surf back in. 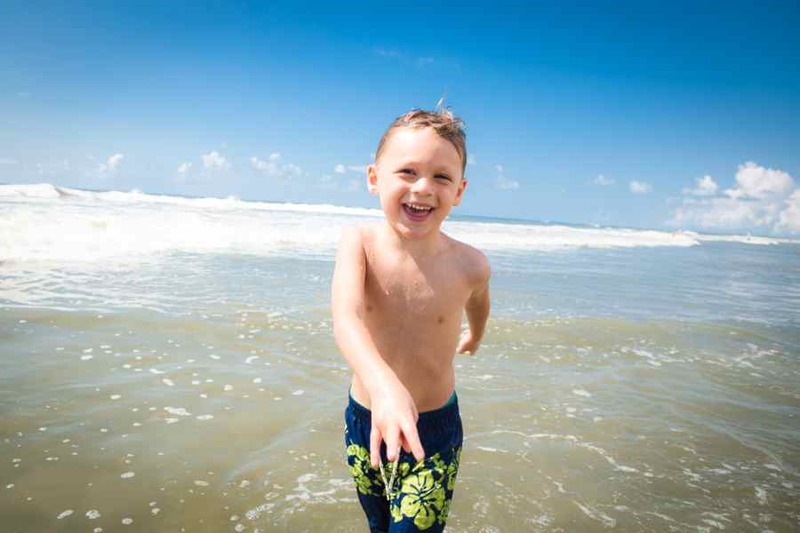 Being in the water had a calming affect on Isaiah, soothed his frazzled nerves and helped him to bond with his dad. Through these times and experiences, the idea for Surfer’s Healing was born. 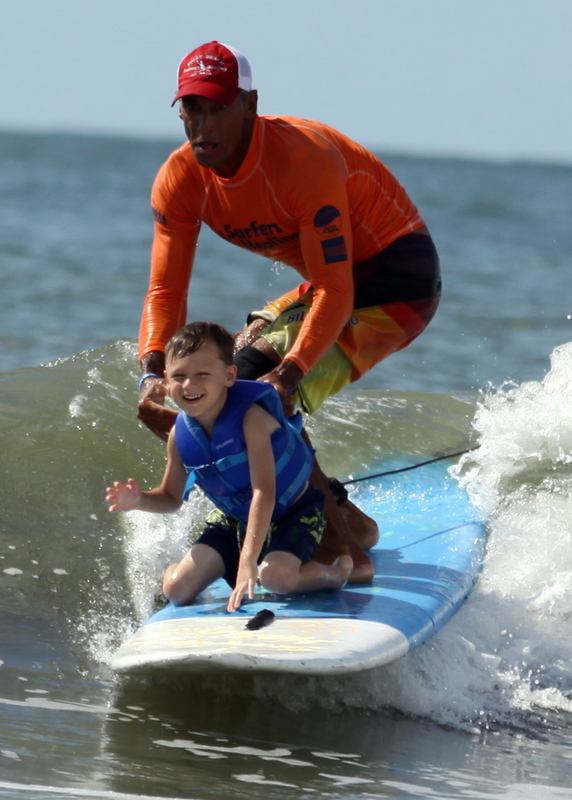 Put kids with Autism from all over the country on longboards with his pro surfer friends and allow the kids and families a day of pure magic. The morning of our particular Surfer’s Healing event was a little crazy. We are not morning people. Well, Cannon is but the rest of us…..not so much! So, my sister went ahead of us to document the opening festivities which I had heard were pretty cool. She relayed that the National Anthem was played by a guy with a saxophone. That it was beautiful and was followed up with two exquisite prayers by the president of the Christian Surfer’s Association and a surfer from Puerto Rico who prayed in Spanish. Then, Izzy said hello, thanked the volunteers, and told everyone to have fun! All the kids were given a call time. Cannon’s was 10:30. Mark, myself, and the boy’s arrived around 9:30 so we had some good, “relax, get used to all the people, and process what’s going on time.” We checked in at the registration tent, got a t-shirt, ate a snack, played in the water, and roughed up the sand for a bit. It took a while for them to select the perfect wave. But when they did……..it was the most incredible sight I have EVER seen! Duane stood up first and then lifted Cannon, putting him on his shoulders! HIS SHOULDERS! Can you believe the amount of strength, balance, and coordination that must require??!! They rode in on that beautiful, sparkling wave smoothly and I couldn’t believe the ease with which Cannon was accepting this new thing and the incredible smile on his face! A smile that I have never seen before! It was shear bliss! The most complete happiness! Total genuine joy! We had found the thing that could give his body all the stimulation it needed, allowed it to let go of all the tension it harbors, and literally gave him the ride of his life. I became so emotional! I was smiling and crying at the same time. My hands gravitated to and covered my mouth as I watched in awe. I knew this moment would be profound but it still managed to blow me away! And my mind would not stop flashing back and forth! Flashing from the amazing picture unfolding before me to a picture of my angel struggling, in pain, and restrained in a hospital bed with all kinds of tubes and wires attached. The difference in the two pictures was startling and fantastic! 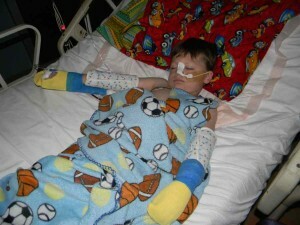 My sweet and precious son has been through so so much! Hours upon hours of rigorous ABA, PT, OT, and Speech therapy, multiple hospital stays and procedures for his related G.I. woes, along with countless E.R. and doctor’s visits. As they got closer to the shore, Duane took Cannon down from his shoulders and placed him in a standing position on the front of the board. I remained in a state of shock! My FOUR YEAR OLD CHILD WAS SURFING! His entourage on the beach was screaming like crazy people! Telling Cannon we were so proud of him, we loved him, and what a great job he was doing. Duane pointed the surfboard back towards the surf and they paddled back out. Cannon was totally compliant and you could tell he was giggling! They rode at least 7-8 more waves in various positions. On Duane’s shoulders, standing, laying down, and on his knees. They even wiped out once but Duane took Cannon right back out. I said “I love this guy!” I was so grateful that he was showing him literally and figuratively that when you fall down, you get back up and do it again. That’s life! The single biggest thing I will remember about this day was “that smile.” I could never possibly express what it meant to witness it, how beautiful it was, and the pride that rushed through my body. It was INCREDIBLE! When his surfing adventure was over, I ran over so excited and gave him a huge hug! As I was assisting the volunteer with removing his life preserver…….another unbelievable moment occurred, one of the best moments of the day. My son, who talks with very very little functionality. And so very rarely comes up with anything on his own. And certainly doesn’t come up with whole complete thoughts by himself, said to me, “Mommy, I love surfing!” I just scooped him up and cried like a baby. I was so insanely proud of him at this moment! IT WAS THE BEST FEELING! I could never thank the Surfer’s Healing family enough for the many, beautiful gifts this day gave our family! I, then, threw my arms around Duane. Again…. I know…..I’m such a baby……., I cried (but I think he was a bit tearful as well). I told him how hard half of Cannon’s precious, little life has been, how difficult it has been for our family, and tried to put into words how much this day meant to us. How much we were starved for a day of such joy! I thanked him profusely. Duane told me how calm, sweet, and polite Cannon was the entire time they were out there. (He sure makes his Momma proud!) We took a few pictures with “Mr. Duane” and then said our reluctant goodbyes. Finally, Cannon was escorted to an area of the beach where he was given a medal for participation and provided with a photo op in front of a surfboard. He seemed very proud of his medal and actually stood still and smiled for the camera. (You have no idea how incredibly rare this is! Like it’s the one time…..ever! Not kidding!) When that was over, so was our beautiful day. And we packed it in. I have decided to redecorate Cannon’s room. And what theme do you think would be my obvious choice??!! Surfing, of course!! I want my son’s room, his refuge….his oasis, to surround him with what he CAN do. Because his entire life he will fight the battle of people thinking he can’t do some things…..just because he has this Autism label. And I want him to know and never forget……HE CAN! Now, I’m done! I promise! Go, watch the video! It’s awesome! And will truly give you a slice of what our amazing day was like! PLEASE feel free to share this post, video, and/or blog with your friends! 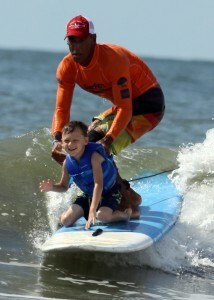 I would love for as many people as possible to see what an amazing organization Surfer’s Healing is! Love to ALL! 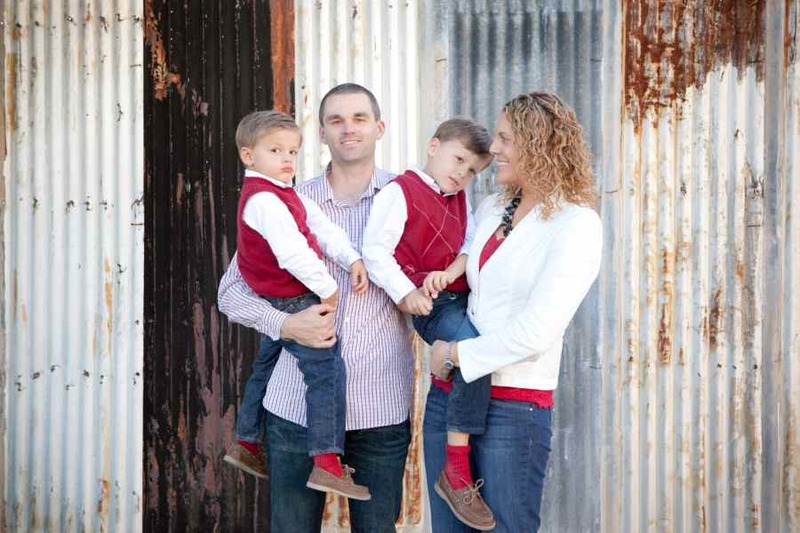 Hi there blog family! Happy New Year! Sorry we are a bit late saying so but as usual things are busy busy around our neck of the woods and I managed to get a little behind! So, I won’t waste another second but get right to sharing some of the goals, hopes, and dreams of our family for this God-given New Year. Have a look! Goals for the year 2012. I have a few. First off, I want to learn more when it comes to computers. So I can become more self sufficient, creative, and innovative with putting this blog together. My sister, Rebecca, is the one who made this idea of mine a reality 10 months ago. She built this site from the ground up per my vision and instructions and has injected postings for me up until the last couple months. And its time to grow some wings and give her a break! (I Love You Rebecca! Thank you so much for all your hard work!) I also pray that this blog can continue to keep to our primary goals of getting our story out there, supporting others walking the same road we are, educating those not affected about those who are, and hopefully encouraging all who read it through our honest, spiritual ups and downs. To continue to be real. Never to sugar coat. And most importantly, to praise God no matter what is going on! We also plan to step up our game at home! To have a more organized, precise way for Mark and I to work with Cannon. A specific play therapy program. We have a lot of tips and tricks but just want to follow one school of thought through and through. Succeed and thrive or crash and burn. And obviously if the latter happens, we stop and move on to something else. But without giving up on the concept. So, we are purchasing materials to compare and contrast 2 programs (the Son Rise Program and Floortime Method) for potential implementation in our home. Both that are okay for the parents to perform and similar in ideology. So, stay tuned to hear what we decide and how that goes……. Our final goal is to make our house better for Cannon this year. Mark began a big project last week. He knocked down a porch on the back of our home and we are building a new room. The boys playroom will move out there and the current one will become Cannon’s new sensory room! I am so excited for him that this is finally happening! This room will help him to safely work out his frustration on bad days, self regulate on good days, and to just have fun in a not overstimulating environment! We will truly feel like we are doing right by this amazing child when this project is completed! Finally, I have some hopes and dreams. I pray for health for our family. As nice as our local Children’s Hospital is…….we hope we don’t see the inside of it as much this year. We pray for happiness. For more time with friends and doing things we used to enjoy. For more time…. just Mark and I. We dream of Cannon making amazing progress in therapy. And coming back to us little by little. And finally, and most importantly, we will strive for a deeper, stronger, and more meaningful relationship with our Father in Heaven. Because even if all the other things don’t pan out, God and our relationship with Him is all that truly matters. It is HIM that will get us through. Our pastor’s New Year’s sermon was quite inspiring! He spoke of being available to God in 2012. For Him to work through us and in us! He challenged us to allow ourselves to accomplish all He has for us. I was driving home and heard this song by Kari Jobe and it just drove it home to me even more! Kinda gave me a new anthem for the New Year! To remember that God calls me to be a light in the darkness, to be set apart, and to try and impact others through my actions and words. (Read more in 1 Thessalonians 5!) Check it out and be inspired! Blessings to each of you and yours in this New Year! Well, Christmas is over and the New Year has begun! But I have been so snowed under with a project I will tell you about soon that I did not get a chance to tell you how Christmas wrapped up for us! And I had a few interesting things to share. So here goes….. I last spoke with you on Christmas Eve and told you our plans. Well, all went according to those and we baked cookies, attended church, and each opened a gift. Church was quite an event due to the fact that both boys had to join us! There was no nursery. 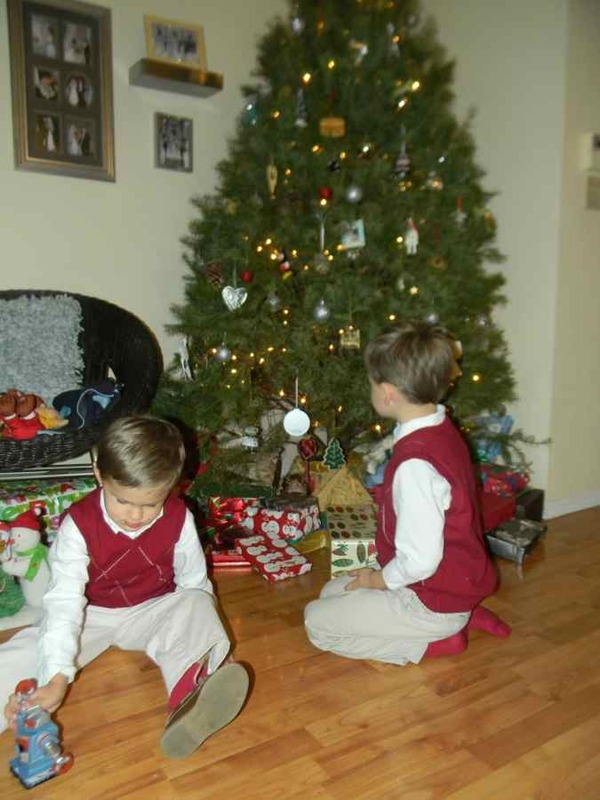 My little men looked so handsome in their cute matching sweater vests, khakis, white oxford button downs, and tan leather boat shoes. Hair moussed to perfection. But, man, oh man, were they a lot of work in that environment! Cannon actually made it all the way to the sermon. Which was a Christmas miracle in itself! Thank God he loves letters and the video screens provided an endless opportunity for indulgence in that love. And he also loves the hymn book, you might remember. He flips through and reads all the titles. He cracks people up when this sweet little boy voice is exuberantly reading, “A Mighty Fortress Is Our God, Come Thou Fount Of Every Blessing, and O Sacred Head, Now Wounded.” So, those 2 things worked for a while. Then, we moved to snack mode. Well, unfortunately, I made a poor choice in snack selection. Veggie Stix….a baked snack that packs quite a crunch. About the loudest snack a child who eats like a cow could eat in a quiet room. Ugh! Way to go Mommy! I just sat there praying that he would eat quickly. Because there was no taking it away without meltdown once I realized my idiocy. After that, I had no ammo. He wasn’t interested in any of the small toys I had brought along. I had nothing to throw at the “be quiet and sit still because it is the right thing to do” cause. So, we had to resort to pacing in the Fellowship Hall until all was over. We snuck back in for the final song. Long enough for Cannon to see all the candles lit and hear everyone singing his favorite Christmas song…..”Silent Night.” Townsend did pretty good considering he is 2. He was mobile and into things but he made it through the whole service with his Daddy. When we got home, we set things up for Santa. Cookies…..check. Milk….check. Carrots for the reindeer…..check. All on special Santa plate…..check. The boys were very excited! They each opened a present. Townsend opened a robot called Sparx from the Toy Story 3 movie. And Cannon received the Hungry Hungry Hippos Game. 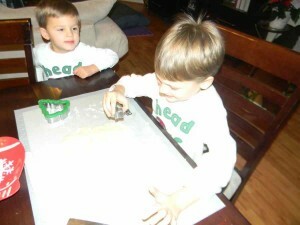 Christmas pajamas were thrown on, a few pics were attempted, and 2 tired boys hit the sack. The next morning was sooooo much fun! They awoke to find a barren plate with nothing but a bunch of crumbs and a note from Santa. It said, “Thanks for the cookies! Love, Santa.” Cannon carried it around reading it over and over. With Mark’s work schedule, we decided to wait until after breakfast to show them their Santa presents. I told the boys that I hid them until we were all ready. So, we had a delicious breakfast of sugared bacon, creamy scrambled eggs with green onion, and fresh fruit. Cannon had a version of this that is appropriate for his diet. 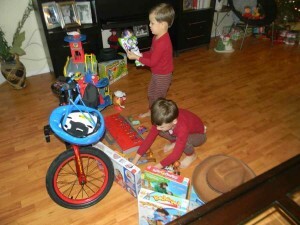 After breakfast, Mark took the boys to the playroom and I began to pull out all of their gifts from Santa. A Cars bike for Cannon. A large wooden parking garage with cars for Townsend. For both, lots of games and almost every Toy Story character there is. Each gift had a specific purpose and ulterior motive. We are careful to pick gifts for our boys that will be fun but also serve a therapeutic purpose. Turn taking games have long been recognized as an important tool for kiddos on the Spectrum. Temple Grandin, a popular Autism Activist, says they helped her immeasurably. Each day, we have been having game time, playing various games for as long as we can maintain engagement. So, 6 news ones were selected individually with that in mind. Don’t Spill the Beans, Guess Who, and Scatterpillar Scramble to name a few. Don’t Spill the Beans is a game of precision for this age while Guess Who is great for forcing Cannon to notice people’s features and Scatterpilar Scramble is a good one for his fine motor skills as it uses tongs to place a marble on a moving target. The acquisition of just about every Toy Story toy on the market also had a plan behind it. The boys really enjoy the 3 movies and I love that the main theme throughout is how the little boy, Andy, plays imaginatively with his toys. So, my idea was that if we had replicas of each toy, we could act out scenes from the various movies. And hopefully eventually begin to add lib some of our own ideas and eventually move on to coming up with scenarios on our own. We will see in time if this works but it feels like a good plan. Now, for the bike. It has taken the better part of the last 2 years for Cannon to learn to ride a tricycle. We tried and tried to get him to just put his feet on the pedals and keep them there. Long enough for him to realize that with minimal effort, he could push off and pedal till his little heart was content. But for the longest time, no interest whatsoever and especially no excitement and therefore effort. If he did anything, he would walk the tricycle around. But recently, he began to just keep his feet in the right place and allow himself to be pushed around. But slowly….the effort came until he finally began to do it all himself and ride like a pro. We were so excited! And our therapy agency suggested we ride the wave and get him a bike. So, Santa must have been listening and took care of that for us. When the moment came that they saw their gifts….I was just as excited if not more! The looks on their faces were priceless and so much fun to be a witness to. Not much makes me happier than seeing one second of joy from my children! Cannon went straight for Woody while Townsend made a b-line for Buzz Lightyear. They excitedly shared each one while checking out the features and looking around in awe. It was so precious! Eventually, we moved on to let them open their presents under the tree. The first present Cannon opened was a Charlie Brown Christmas Recordable Book from one of his therapists. He loved it so much that we couldn’t get him to detach and open another for 20 minutes! 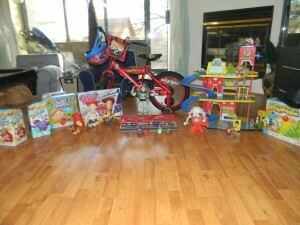 They opened lots of exciting gifts like more Toy Story toys, videos, books, outfits, and gift cards! Quite a haul I should say! They ended the day with giving Mommy the best gift! They both took a nap at the same time! I cannot tell you the last time that happened because it has been at least over 3 years ago! It was incredible because I got to do what I love which is cook till my hearts content all while listening to my music! I cooked up a really fun dinner of roast duck with a raspberry sauce, candied sweet potatoes, grits dressing, and cranberry muffins among other things. After enjoying dinner, reading the Christmas story, and watching “A Charlie Brown Christmas” for the last time……our boys were toast and went to bed! It was a GREAT day! One that was thankfully mellow and meltdown free! A wonderful day together as a family! A fantastic celebration of our Savior’s birth! I sure hope each of you can report similar days! I leave you today with a awesome video! One I did not think I would be showing you anytime soon! I told you how it took Cannon 2 years to learn to ride a tricycle. So, we obviously assumed it would take him a while to get the hang of his new bike. Well, we were happily mistaken! Less than a week later, our little miracle was cruising around the neighborhood! One of his therapists took this video on his cell phone the first time it happened! I love hearing how excited he is and seeing the look of pride on Cannon’s face! A great moment to wrap up our Christmas! Love and peace to each of you!